President Donald Trump told his Department of Justice to try changing rules for detaining migrant families. It didn't work. 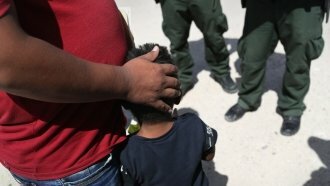 A federal judge in California has denied a Department of Justice request to be allowed to detain immigrant children for more than 20 days and be excused from licensing requirements for detention centers. The DOJ had asked the judge to amend a 1997 settlement in a case called Flores v. Reno. The agreement puts a cap on how long immigrant children can be detained, and it has major implications for the Trump administration's "zero-tolerance" immigration policy. In his executive order effectively ending mass family separation at the U.S.-Mexico border, President Donald Trump told his Justice Department to try to change the Flores settlement so authorities could detain families together and keep them there throughout their prosecution. Amid the furor over family separations, Homeland Security Secretary Kirstjen Nielsen kept defending the practice by saying the government wasn't allowed to keep families detained together. "If we close the loopholes, we can keep the families together," Nielsen said at a White House press briefing in June. "After 20 days, we have to release both unaccompanied children and accompanied children. Which means that we cannot detain families together. The only option is to not enforce the law at all." This is one of the cases she was talking about. Because of the 20-day cap for detaining kids, the government has three options: Detain families together for just 20 days, separate parents and children, or not detain families, period. It's a dilemma past presidents have dealt with, too. The Obama administration tried to house families together for a longer period of time, but it didn't work then, either. The same California judge said that violated the Flores agreement back in 2015. The DOJ had also wanted a pass on state licensing requirements, saying they were holding up its ability to address an influx of migrants. It said it didn't object to the requirement that facilities be in good condition.